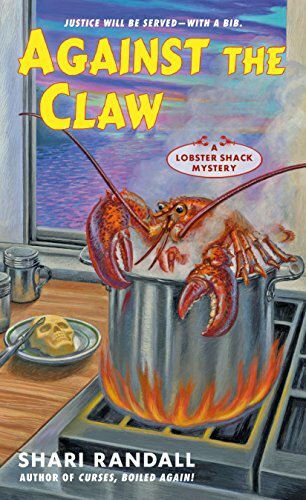 The second Lobster Shack mystery, after Curses, Boiled Again (reviewed here), is as good as the first! Against the Claw starts with Allie pulling lobster traps with Bertha. The last trap also pulls up a dead girl. With Aunt Gully’s Lobster Shack expected to host a huge number of customers on the Fourth of July, a catering opportunity that is too good to pass up appears. Catering the famous modeling agent Stellene’s annual party would be excellent publicity. When Allie and her sister Lorel get the opportunity to stay on Stellene’s massive yacht with only superstar singer Eden and her guitarist boyfriend on board, it seems like the perfect day. But when Lorel’s recently ex-boyfriend Patrick is found dead in the morning in a raft tied to the yacht, the party abruptly ends. I love the characters in the Lobster Shack books. They feel like old friends who are stuck in bad circumstances whose wits will ultimately win out over evil. The mystery was good—not to easy or too difficult to figure out. You definitely do not need to read the first book in the series, Curses, Boiled Again, to enjoy this one. Even better, Against the Claw has no spoilers to the first book so they can be read out of order. Highly recommended to cozy mystery fans. 4 stars!